Schizophrenia is a weird condition. It afflicts the sufferer under unknown starting conditions and is completely debilitating when it strikes. So it is tonight, the Ireland team who are reflecting on what they know about curling and what they know about their own team dynamics. The game started cautiously enough, which was good for the Irish team, it gave them an opportunity to play themselves into a game that they started decidedly shakily. And from there it went downwards at a fairly low gradient with the loss of a two and a steady stream of ones as a mixture of bad draw weight, poorly called ice, and shots which required Thomas Ulsrud to turn up were performed as the final shots. And so it was onto the fifth end break – the team had to decide whether to continue their current tactics or switch to new ones. If they switched to new tactics, what would they be? The answer was this: ‘why don’t we try and be aggressive like we were on occasions against Latvia’? A game of two halves is a hackneyed phrase but it adequately describes this game. The Irish team went onto the attack and the Austrians struggled to handle the switch. In the sixth end the Irish team called an early timeout as a promising end developed that might have allowed a four, but the angles were just slightly off. A two at the seventh turned up the heat just a little bit more and it was obvious that the Austrian team had lost the momentum and were uncomfortable with the new status quo. It was the ninth end, though, that decided the game. 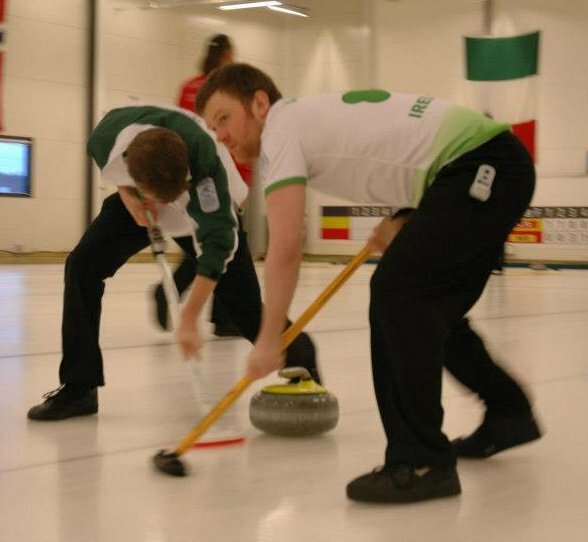 The Irish team were lying three stones with the Austrians’ final skip stones to play. Unfortunately, he managed to lift the three open stones forcing the Irish to draw for a desultory one, leaving little hope in the final end. Final score 6-4 to Austria.